After a previous report claimed Samsung was aiming for a late July unveiling for the Galaxy Note 9, a new one from The Bell now states that this is no longer the case due to a last-minute design change. As noted, it appears Samsung’s Vice Chairman Lee Jan-Yong visited a number of local stores in Shenzhen to check out competing smartphones and, upon doing so, the Chairman is said to have realized that other smartphones offer an increased feeling of grip. In light of this, Lee Jan-Yong reportedly spoke to Samsung’s engineers in the hope fixing this issue by reducing the thickness of the Galaxy Note 9’s display glass by 0.5mm, a decision that has ultimately led to a delay of two weeks. If this is the case, the Galaxy Note 9 should see an official announcement towards the beginning of August, falling in line with the company's typical timeline, with sales then expected to commence by the end of the month. Currently, the Galaxy Note 9 is expected to introduce on minimal updates over last year’s flagship, one of the biggest external differences being a minimal increase in display size – the Galaxy Note 8 boasted a 6.32-inch panel, whereas the Note 9 is set to feature a 6.38-inch display. On a hardware note, Samsung’s Exynos 9810 will power the device in all markets except the US, where the Snapdragon 845 by Qualcomm will be employed. This should be accompanied by 6GB of RAM and 128GB of internal storage. Although a previous rumor said a 512GB variant was being debated. 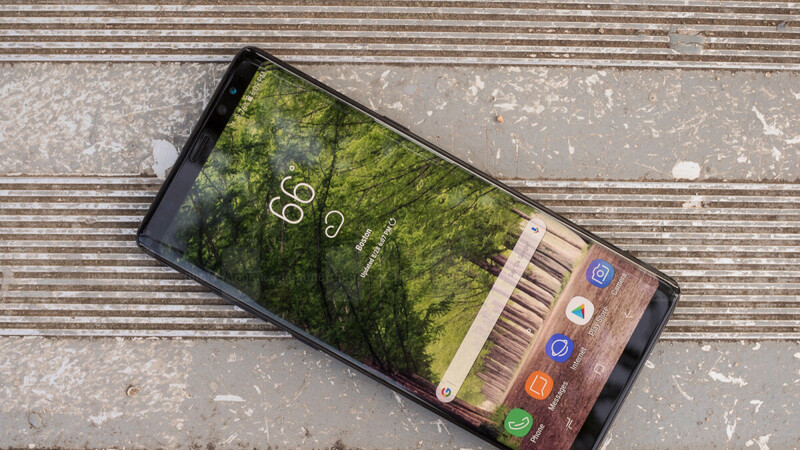 If Samsung chooses to stick with an August release, the Galaxy Note 9 will be once again be given a much-needed head start in the flagship market. After all, not only is Apple’s new 2018 lineup expected to arrive in mid-September, but the South Korean company will also face increased competition from the LG V40 and Huawei’s Mate 20 line come fall. 0.5 mm change in thickness makes that much of a difference and a design change only causing 2 weeks delay.... Sounds legit... More likely: Usual rumors of an extry early release were false, as they are most of the time. This is the façade to cover the false rumor with another invented one. Yeah, this. Or they are just behind schedule. Design change is highly unlikely. Seems a little far along for that. "More likely: Usual rumors of an extry early release were false, as they are most of the time. This is the façade to cover the false rumor with another invented one" Exactly It was never going to be released early. Just all the Samsung hate sites starting s**t.
Or consider that to implement an under screen fingerprint scanner the whole AMOLED screen can't be more than 1.2mm thick. Then a two week delay if not more would make sense. Yup. I think you're right! "increasingly more 'grip'"? If they want to add more grip, then don't make a device out of smooth metal and glass. Also don't put such large screens in the device so that people can actually hold them with a single hand, again. Then don't get the note. The note is purposely made to be used with two hands. Agree with Carlos. Simply do not purchase. Not sure what you're whining about....the Note line has always been designed to be large. Get an S9 if you want a smaller device. I dont think there is a direct competitor for Note series. I only want to buy a note because it has a note. I like some aspects in it and i hate some (like the terrible batter). You could say phones like the V30/V35 and the iPhone 8 Plus could be direct competition but most people will say no just because those two don’t have a stylus. Those are basically direct competitors for the Plus version of the S series, since the size difference between that and the Note has become minimal or in some cases nonexistent. Careful JY Lee. Researching the characteristics of the competition and making changes based on it is reffered to as "copying" by many people. 4500mah battery would be great and make the Note a 7in phone. They will add a notch. Checking out competition....Hmmm, Call me crazy but the majority of the competition has employed a Notch, Its plausible that the real goal is to get a notch implemented.